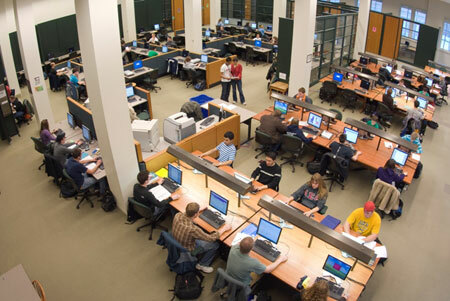 Open Academic Computing Labs are located in Pickler Memorial Library 312 and Violette Hall 2001. There are also labs or student kiosk machines in all of the Residence Halls. Pickler Library 312 area has ten study rooms that are available to study groups. Click on the links below to see specific information about each lab. Every residential hall has one HP Laserjet printer available for students to print projects, papers, and etc. Each semester, students are allowed $15 worth of free printing to any of the lab printers. If that amount is exceeded, they have the option of purchasing more printing credits from the Cashier’s Window in McClain Hall or from the Truview web interface: Access the “Student” tab, then click on “Add Money to Your Printing Account”. Several software applications are available, including Microsoft Office 2010 Professional. The Windows 7 computers also have the academic-specific software installed. For a complete list of available software, check out the Lab and Classroom software link at the top of this page. The residence halls are open 24 hours a day when classes are in session, unless otherwise stipulated by the Hall Director. For more information, you can contact the IT Service Center at 785-4544.